I have been very fortunate this year to have a fantastic group of students as well as a wonderful co-teacher. Every crazy idea I have had they have all supported 100%. I get up every day excited to go to work for the chance to work with these wonderful people. My Honors students are exceptionally open-minded. I decided to do away with traditional notes for the Gas Laws unit and let them tell me what they know about the properties of gases. We spent about half of the block breaking through all the misconceptions they had about their world and it led to great discussions in both classes. Then we learned about the relationship between Pressure and Volume using pressure sensors and a syringe. They quickly understood the inverse relationship between the two properties and I was very satisfied with the lesson. And while this is going on, the student at the board is playing with the simulation. She is moving the little man to change the volume and pumping in more gas. Well, that’s the point where I was no longer needed in the room. 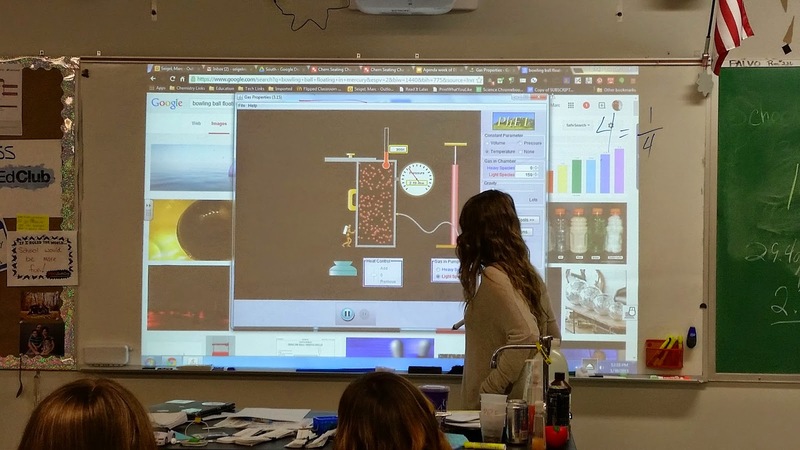 The class began to yell out things they wanted her to do: raise the heat, lower the heat, pump in heavier things, blow the lid off, add tons of gravity. I had planned to use the simulation as the next class’ lesson, but the students were so into what they were learning that I literally couldn’t stop them. I tried to do it. TWICE. But I was completely ignored. I sat down at a desk and snapped these pictures. Naturally others wanted a turn so we needed to rotate. I made whomever went to the board make a statement for the class to add to their notes on the topic. No PowerPoint, no outlines, no formal notes. In one block we covered an entire unit’s worth of material. And the best part, every word is theirs. I told them nothing. I am a really lucky teacher to work in a school that has amazing students that let me do the crazy things that I do. 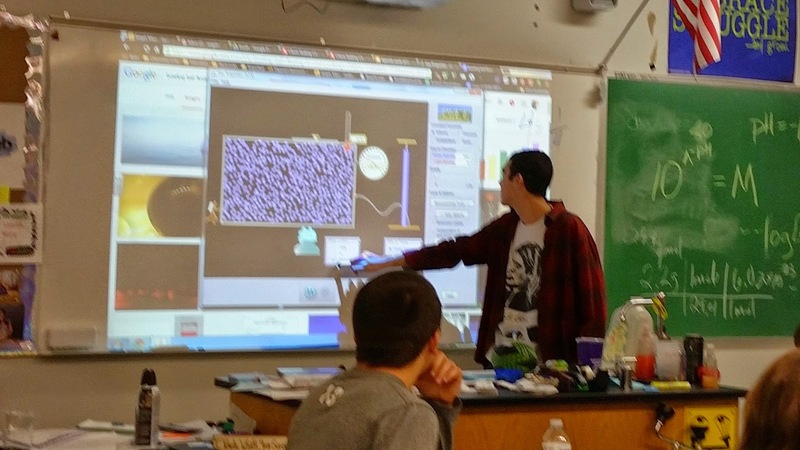 This entry was posted in #flipclass, gas laws, PHeT, student centered, students on January 31, 2015 by DaretoChem.